Bear-Patrol Christmas party at Camelford Arms in December raises £605.38 for Rainbow Fund. THIS makes the total raised by Bear Patrol in 2017 to £29,968.28, bringing the running total raised for good causes since the group started fundraising in January 2011, to £188,098.02. Amounts in 2017 were raised for: The Sussex Beacon, £15,416.01: MindOut, £5,305.56: Brighton & Hove LGBT Community Safety Forum, £4,193.04: Sussex Cancer Fund, £2,855.30: Rainbow Fund, £1,321.97: Brighton & Hove Sea Serpent, £350.00: The Deans Beach & Environment Volunteers, £266.54: Rockinghorse Children’s Charity, £259.86. 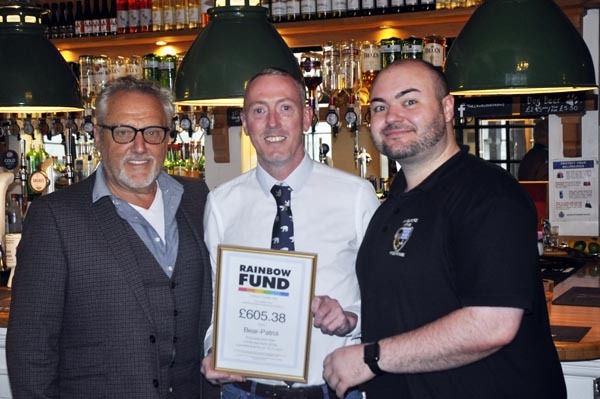 Pictured: Chair of Rainbow Fund, Chris Gull with Danny Dwyer from Bear-Patrol and Tom Morris assistant manager at Camelford Arms.